For his debut exhibition with Blain|Southern, Italian artist Pietro Ruffo has created a series of large-scale, intricately worked drawings on paper. The inspiration The Political Gymnasium derives from Ruffo’s time spent as a research fellow at Columbia University, New York, in 2011. He studied a number of American philosophers, concentrating on John Rawls’ and Robert Nozick’s theories relating to freedom. In his seminal work, Anarchy, State and Utopia (1974), Nozick attacks Rawls’ Theory of Justice (1971), in which Rawls proposes a system where the fair distribution of resources will ultimately benefit the disadvantaged sections of society. Nozick conversely argues in favour of a minimalist state, and ultimately questions whether it is ever fair to take something from one individual and give it to another. In order to highlight and further consider Nozick’s arguments, Ruffo has isolated a section of the text entitled ‘The Tale of the Slave’. The Tale comprises nine passages that propose various cases of slavery, through which Nozick essentially contends that taxation is itself a form of enslavement, and that modern democratic states are fundamentally slave states. 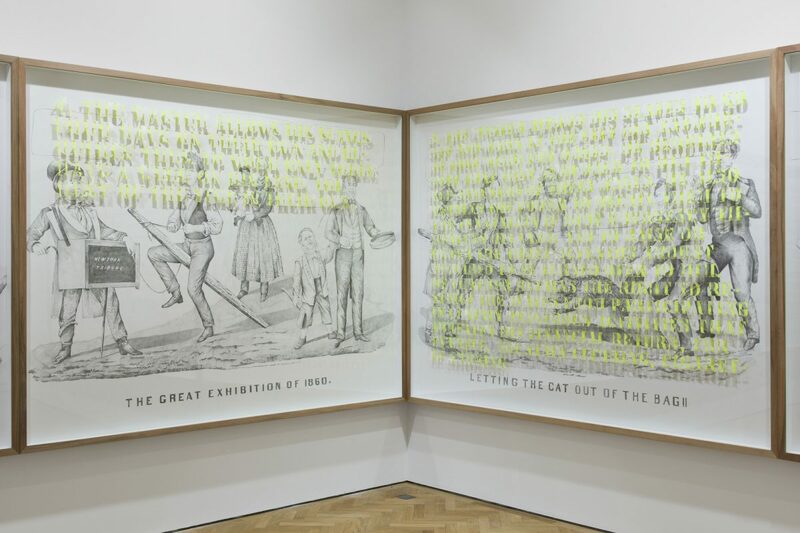 In response to Nozick’s ‘Tale’, and due to the implicit connection that Ruffo sees between the politics of the mid-19th century and those of today, he has created nine finely-detailed pencil drawings appropriated from the work of 19th century satirical draftsmen. We see caricatured politicians, of all shapes and sizes, in numerous comical postures; swinging on bars, leaping into back flips and lifting weights. 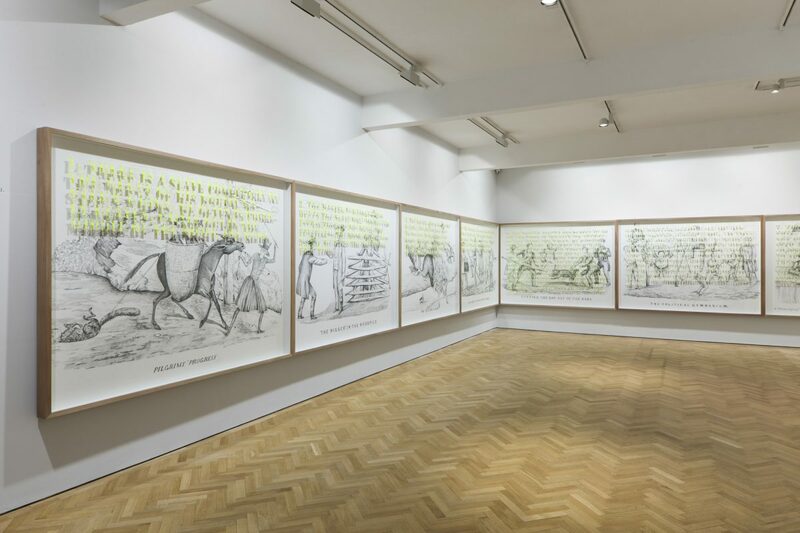 Nozick’s nine sentences appear upon the drawings, delicately cut out, raised above the surface of the work and secured with pins. Thus, a subtle optical illusion is created as the drawings osscilate between two and three dimensions. Ruffo’s engagement with Nozick’s text forms part of his ongoing investigation into a wide range of social, moral and political debates. 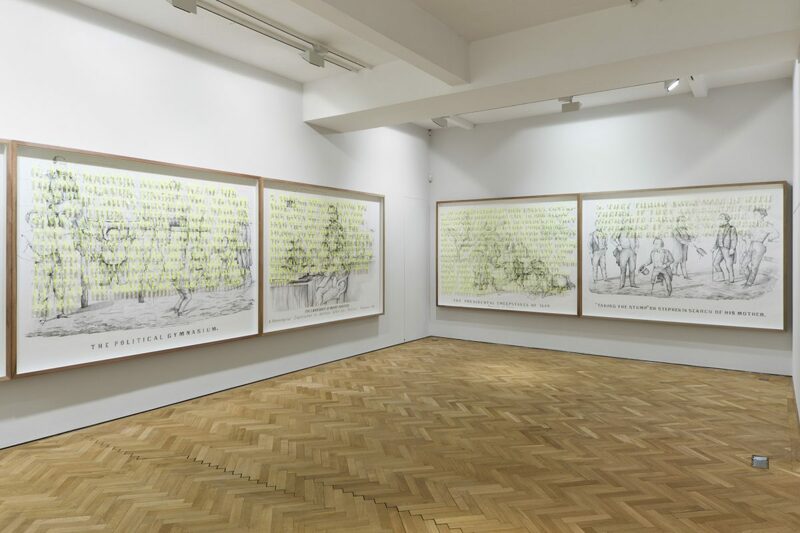 Since 2008, his work has focused on concepts of freedom, as seen in his Isaiah Berlin (2009-10) series, in which large portraits of the liberal scholar and philosopher were drawn upon old maps. The artist’s research is scholastic and yet his notes are graphic, rather than written. He discusses his work not as a finished product, but as process-based research; open-ended and in continuous development. Thus, Ruffo presents the viewer with Nozick’s arguments but allows the individual to decide whether they are in agreement.The Political Gymnasium ultimately leaves us with the eternal question: are we ever truly free?